One of the cool things that I’ve learned at ThoughtWorks is automating stuff. Automating daily tasks is pretty cool and important. For instance, all the teams that I’ve worked in the past 3 years create scripts to automate builds, deploys and database backups between other tasks. At Motonow we try to do the same. Because we use Heroku infra-structure we have to remember a lot of the toolbelt’s commands in order to deploy the app, run database migrations and backup the database. Although the commands are pretty simple, we found ourselves running theses commands in a specific order and many times a day, which bother us a lot. To avoid that, we decided to create rake tasks to automate some of the things we use frequently. Addition or removal of line items can be done dynamically on click of a button without refreshing the complete page. It can be achieved easily by using the reRender attribute of the visualforce component. Below code is a simple example which shows Contacts linked to an Account. User can delete or add multiple contacts to an account by clicking the “Add Attendee” button. The code uses a index called rowNumber which keeps track of the row number to be deleted. Why Excel and Multi-BOM are killing collaboration? I have recently added three new sorting User Defined Functions (UDFs) to the SortFunc-py spreadsheet, and added a new option to the SortV function. The new file may be downloaded from SortFunc.zip, including full open source code. The other two new functions allow sorting of rows, rather than columns. 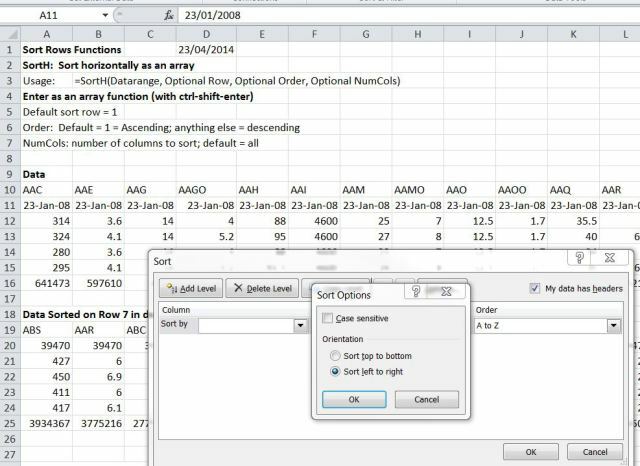 The built-in Excel sort routine allows for sorting in either a vertical or horizontal direction (as shown below), but the new UDFs provide a dynamic sort, when used on the spreadsheet, and can also be used on VBA arrays.